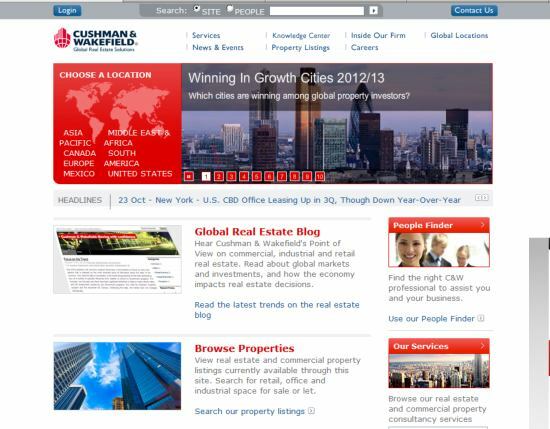 Critiquing the CRE Websites series part 3… Here are parts 1 and 2 if you missed them. Global locations on main menu. Brings me to a page with countries/regions. It seems to know where I am since US/Northeast is already expanded. I hover on New Hampshire and see the office address. A click brings me to a blurb about the office and a contact us link. I click on the contact us link and see more detailed location info and option to search for agents. However, New Hampshire office is not pre-filled in the people search fields. (Knowledge Center) Looks like I have to register to see anything… I know that’s supposed to be a way to get leads, but I don’t like it. Even worse, the sign up form appears on a new tab. They use LoopNet for the most part but buried in the search criteria are links to ORE (? ), Apartment and Executive Suite listings – mini sites with different search interfaces that open in a new tab. Click on services and go to landing page with all the services listed. I select Investor and Corporate Occupier Services. Now I go to a landing page to select one of those. It turns out Investor and Corporate Occupier Services had a drop down menu but the sub-menu didn’t appear when hovering over the main item and the tiny down arrow didn’t register. However, there was a whole lot of content I would have missed if I went directly to Investor services using the sub-menu link. I click on the contact link to find an investment profession. Doesn’t work today, but during another run it took me to the generic “people finder”. Overall – The conventional (in a good way…) upper menu and featured content in blocks on main page make it easy to get around. Contact Us link and people/site search at the top also very good. And for the most part, no excessive use of “mini-sites” so when I click on the C&W logo, I’m back home. Main menu items have no drop-downs forcing an extra click from a landing page thought that does provide a “summary” opportunity for visitors who are browsing. But where they do use drop-down menus, the main item is linked as well as the sub-menu items. For consistency’s sake, use either a landing page or the sub-menu items – not both. Suspect they’re doing it both ways because the menu scripting they’re using acts a little wonky. With big companies, I find it difficult to figure out what they do and what they are trying to accomplish with their website. If find this to be the case with real estate companies in particular, as most of the tech sites I look at are pretty well laid out. And again, a quick look on Google for “Commercial real estate illinois” does not show Cushman in the first 5 pages. Again, if you are not found, your prospects have to go directly to your site, or search on very specific terms, which is not usually going to happen.